I have A LOT to be thankful for this year, especially for all of YOU! :) This blog and all the relationships, connections and opportunities I have made through it have developed so much since a year ago. I thank you all for your support! And if this year is any sign of what the next year has in store for me, I look forward to all that I will be thankful for next Thanksgiving! The wine I paired with the above delicacies :) was one that I bought while in Austria at the European Wine Blogger’s Conference back in October. I was lucky enough to be paired with the winemaker Hubert Sandhofer on a vineyard/lunch visit. 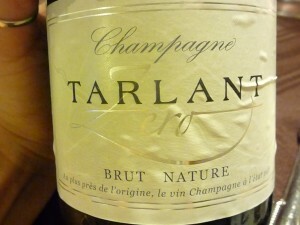 I just HAD to have this wine for my Thanksgiving, so I brought back a magnum of it! YUMMMMMM! The wine is called “Triu” (Trio) and it is from Weingut (Winery) Hubert Sandhofer, the vintage is 2006. It is made from, you guessed, 3 varieties – Blaufrankisch, Cabernet Sauvignon, and Zweigelt. (The 1st and 3rd varieties being indigenous Austrian varieties). 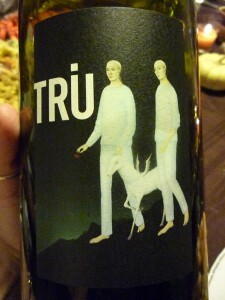 Hubert said he wanted to make a wine that represented the trio a cappella group he sings in called … TRIU :) A MUST DRINK! I must preface this by saying – I am not a fan of dessert or sweet stuff in general (except Frenchie le Boyfriend, awwww!) I know, I know … what is wrong with me? Maybe my sweet tooth fell out with my baby teeth? 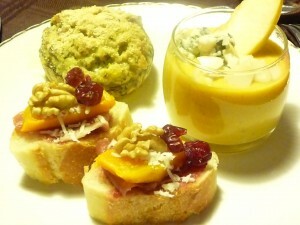 In any case, I am not grossed out by dessert, I just prefer savory to sweet … and there ain’t nothing wrong with that! So for me to pick out a dessert that I like … well that’s saying a lot. So the winner for the Challenge #8 – Dessert & Wine Pairing is ……. 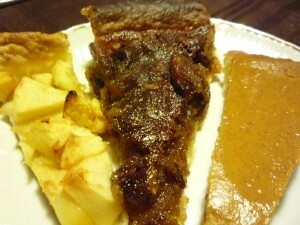 Pie Trilogy (Apple, Pecan & Pumpkin) – I made the pumpkin and pecan pie, Frenchie la Grandma made the apple one. Now off you go my VS Readers, have a wonderful day celebrating everything you have to be thankful for! Previous Previous post: Want to take my “Wine Consumer Online” thesis survey? 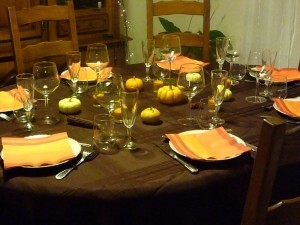 Joyeaux merci-giving… or something… Happy Thanksgiving, and much love for sharing a proper holiday feast overseas. It looks like you put out a great spread. Hahaha, thank you very much! 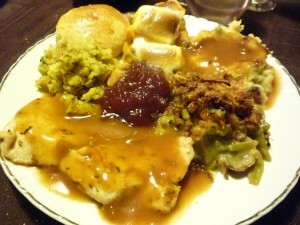 It certainly was a delicious feast :) I hope you have a wonderful Thanksgiving!